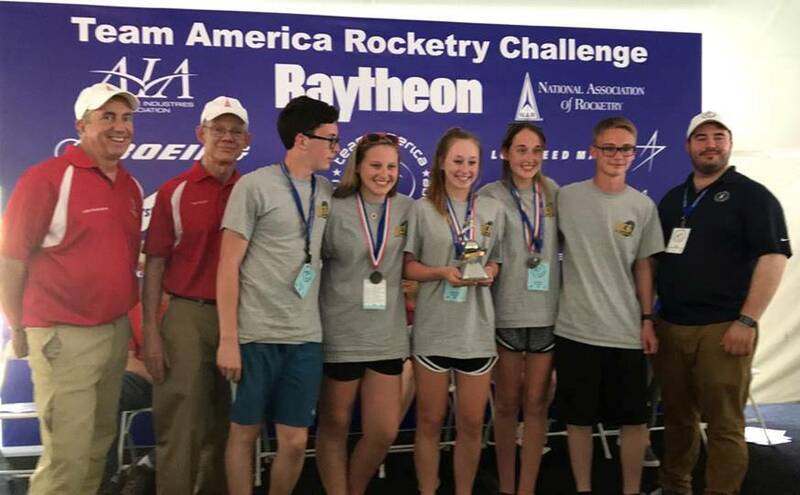 The Russellville High School team #3, the “Lions”, captured third place nationally in the TARC finals May 12, 2018. 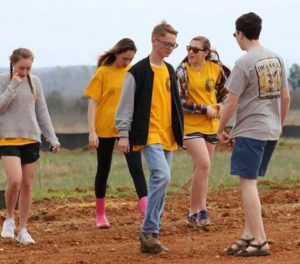 Six Alabama teams qualified for the finals from the 25 original teams registered in the state ranging from Ardmore to Winfield. In the Virginia field where the championship is determined all the Alabama teams made the cut into the top 38 out of a hundred with very impressive first round scores. Huntsville’s St. John Paul II was only 6 feet off the 800 mark with others at 816, 811, 810 and 799. But the second round moved the target altitude to 825 feet, which really spread the field and revealed the best flyers. 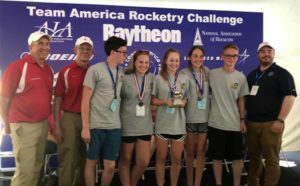 The top ten TARC winners found a way to go higher and the rest were stuck under 800 feet. Russellville got to 835 and their total score of 26 was just barely behind second place Festus, Missouri at 25.76 (who were first in 2017) and the overall winner Creekview, Georgia at 21.2 (who won in 2014). Scores escalated into the thirties and forties after fourth place. The Russellville Lions team members are Malachi Fleming, MaKayla Gann, Mia Gann, Zakery Colburn, and Emma Reed and are shown above receiving their trophy from NAR and AIA at the award ceremony and in the photo below during their qualification flights. Congratulations to these young people and all the teams for a fine display of rocket science and for making the state proud.